Canada is a beautiful place where one can find the best combination of good life and plenty of opportunities to grow. 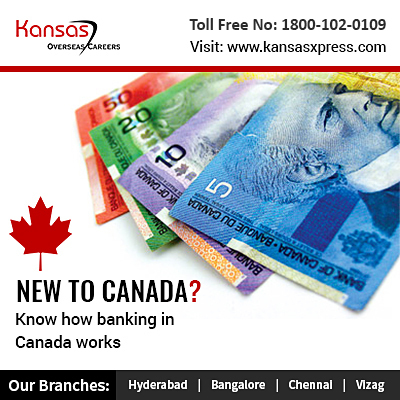 One of the main concerns that you will have is that of opening a bank account in Canada. New to this lively country and want to know the exact way in which banking works here? Then here are some things that will help you! One thing that you can be rest assured is that here in Canada you have plenty of options when it comes to opening your bank account. You also need not be worried about the security aspect because the Canadian Banking system is pretty secure and safe. You can carry cash, but most of the times people depend on their debit cards and credit card. The debit card is called as the interact and it is linked to the user’s bank account. The amount is debited from the account when a transaction is made. The credit card has a credit limit and the user needs to pay back the amount spent on a monthly basis. To open a bank account in Canada you will need a valid ID proof and you will have to prove your status in Canada. If you are going to do just a few transactions, then you can opt for a basic account which is free or involves a less fee. For those who need to do more transactions may have to opt for a bank account where they will need to pay a higher fee. But most of the times the fees are competitive and affordable. Even if you have a temporary status even then you can easily open a bank account. You will only need to make sure that you have a valid ID proof. If you have the required documents, then even temporary residents can open bank accounts. A good credit score speaks volumes about your financial standing. A credit score depends on the payment history of the person. It is important that the person has a good credit score as it gives an idea whether the person is a responsible person with good financial status. Overall, one can say that the banking industry in Canada is pretty competitive. It is one which gives plenty of options to the immigrants to open bank accounts. All that one need is a valid id proof and some other documents. In case you need to know more on this then you can get in touch with us a Kansas Overseas Careers. We have successfully helped many aspirants to migrate to Canada. You too can be one of them. We can provide you with all the details and guidelines that you may require in order to move and settle down in Canada. Just get in touch with us right away for more details.